I’m easily impressed with athlete’s accomplishments on the field of play, but not so much once they leave the game, as many tend to wait too long to get their post-career steps going. 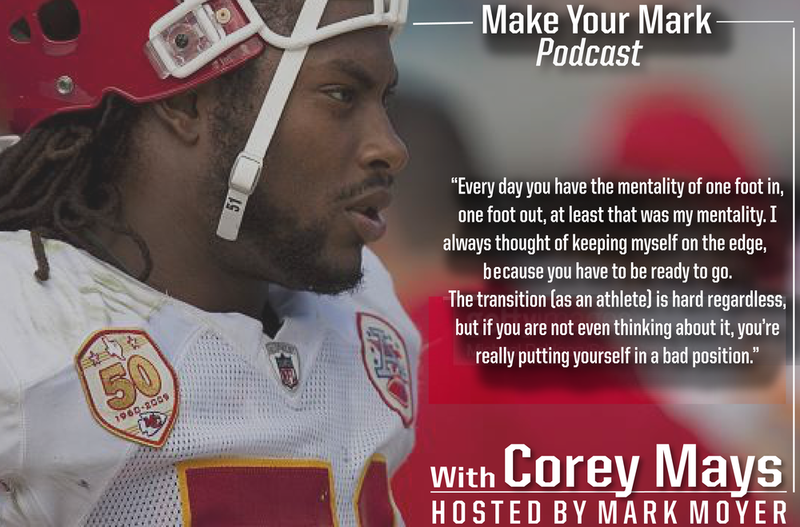 My guest today, Corey Mays, is quite the opposite, as he immersed himself fully into being prepared for the eventuality of retirement, and has become a role model for current athletes to emulate. Corey was fortunate enough to play football at Notre Dame, signed as an undrafted free agent and played four years in the NFL, and prepared himself for his post-playing days by enrolling in business and finance-related classes and working in internships while in college. He launched his angel investment firm, A-Maysing Enterprises LLC in 2013, through which he invests in a variety of businesses, including uStadium (a sports social media app), BuildMyStay (a travel concierge software platform), Vice District Brewing in Chicago, Heritage Link Brands (a wine importer), and Love Cork Screw (a wine brand). Corey also took the step of pursuing his MBA, graduating this past May from Notre Dame once again. You’ll learn so much from our talk, especially if you are considering jumping into the waters of entrepreneurship, or you are an athlete wondering how to start preparing for your life after the game. Corey has a great personality, is funny and engaging, and offers superb advice throughout. Happy listening!